In the end of September, British street artist, Banksy, announced Better Out Than In. Staying true to where he is coming from, this current project is about art in the streets. So instead of showing his works at a gallery – and there are surely all doors are open to him – Banksy uses the urban environment for his exhibition. For Better Out Than In, Banksy has chosen to play at New York neighborhoods. Ever since he kicked his project off on October 1st, there has been one new artwork, video or performance each day. 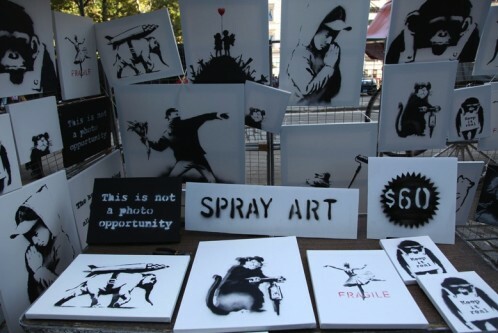 Yesterday, he set up a stall in the park selling 100% authentic original signed Banksy canvases for $60 each. Nobody payed attention to it. And only some few people who came by accidentally and needed something “for their walls”, bought a piece. The total intake has ran up to $420.